It was hot. There was not the sound of a single bee buzzing. The wood appeared to be empty of animals, and magical beings. Breeze was on his way to the river. He wanted to paddle his feet. A loud rustle among the leaves above startled him. He spotted a long tail and wondered if it was a giant mouse. It darted away from him. Breeze followed. He ran from tree to tree, staring upwards. Suddenly he tripped. He hit the ground with a loud thump. Breeze discovered he had fallen over Hamish. Breeze decided to leave because a grumpy elf is better left alone. He walked on looking for the mouse and Tulip stopped him to ask why he was looking upwards. He told her about the mouse. “Lets look for it together.” She said and then they heard it. Tulip said, “It’s a kite.” she said and flew high above him to release it. “I’ll show you.” Tulip took the kite and flew a short distance away. The wind caught hold and the kite flew after her, swooping and diving. With it’s long tail dancing in the wind, it attracted a lot of attention. Mrs. Groundsel and her grandchildren came to watch the fun. As the kite tumbled about in the air something strange happened. Each time it danced in a certain direction so did everyone on the ground. 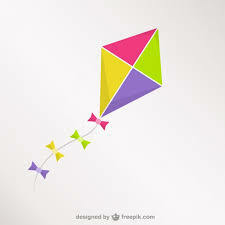 If the kite dived to earth, everyone watching fell to the ground. When the kite flew high into the sky, then everyone jumped off the ground and they rose high into the air. The kite began to dance as it moved. “This is not funny.” Mrs Groundsel puffed as she jigged about. “I think I know who did this.” Breeze said and marched into the wood. Tulip couldn’t pull the kite down. It continued to dance in the sky. Everyone watching danced on the grass. “I’m too old for this.” Mrs. Groundsel said. Breeze arrived back with a squealing young witch called Lovisma, tucked under his right arm. “Why shouldn’t we? You have been nasty.” Breeze said. She clicked her fingers and the kite raced landed on the ground. Everyone sat for a rest. “You are one mean witch,” Tulip said. The story of Star the stubborn duck. Breeze decided today he would find the answer to the question, – why would a duck wear wellington boots? He dressed early, long before the sun was up, packed a snack bag full of berries, oat bars, apples and a giant raspberry muffin. 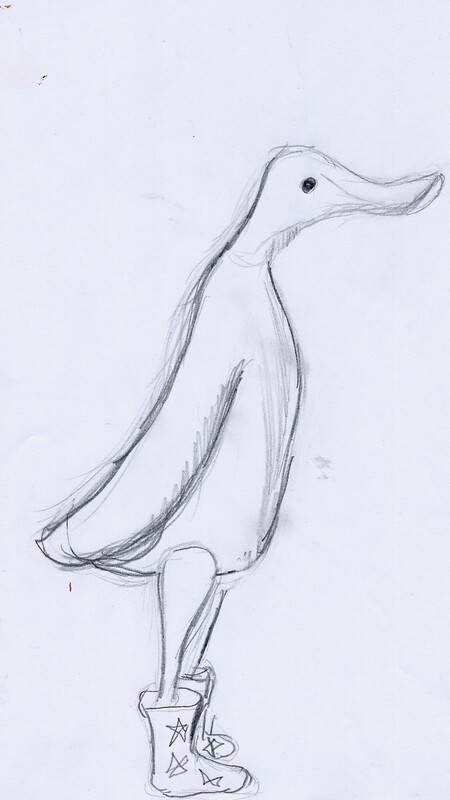 “Best not take any chances for I could be waiting a long time for this strange duck to appear.” He muttered. When he arrived at the pond he was happy to see the only occupant was a frog. Spike popped out of Breeze’s pocket and went to have a chat with his friend on a lily leaf. Breeze climbed into the nearest tree close to the pond and sat. Soon he was rewarded by the sight of a long thin duck clomping his way across the grass to the pond. Breeze decided to stay where he was, so he wouldn’t frighten the strange duck. The duck looked at Breeze and said, “Morning.” Then turned to the water and bending low took a long drink. “Thank you. I rather like them as well.” The duck sat down on the grass and stared at Breeze. “I don’t see many ogres hiding in trees.” The duck said. “And I don’t see many ducks wearing blue boots with yellow stars.” Breeze politely replied. Breeze decided then and there he liked this strange duck. “I am Breeze, would you like an apple?” At the duck’s nod he threw an apple to the duck. “Thank you I am Star.” the duck said. “Good bye Star, I will ask my friend Tulip to solve your problem.” As he left he noticed a sadness in the ducks eyes. “So I should help her if she won’t help herself.” He muttered. Breeze went in search of Lovisma. He found her concocting a smelly potion in her favorite bright red cauldron. “I don’t care.” Breeze said. He walked over and gave the witch a nudge with his elbow sending her wand flying some distance away. She fell over and he sat on her. Lovisma grumbled and groaned but she did as he asked for one simple reason Breeze knew too many people whose magic was stronger than hers. Breeze returned to the pond and wasn’t surprised to see a pair of blue boots with yellow stars sitting beside his empty lunch bag. Sitting on the bag was a note. It read: Thank you for helping me, I am flying to the nearest orchard to find some sweet apples, they taste better than fish. Breeze hoped she would leave some apples for him because he would hate to have to squish a pretty thin duck. Matt’s Christmas Adventure. – A Christmas 2 part story. It was the 24th December. Every child, big and small, was hoping Santa would stop in Mudpile Wood. Last year he had enjoyed a mug of hot milk and some of Tulips Cinnamon fairy cakes. This year she planned on giving him Mincemeat bread along with his customary hot drink. Breeze was collecting holly, with berries, for his relations. Ogres loved to decorate their cave with holly. This meant Breeze had to fight off the birds who wanted to eat the berries not sit and look at them. He began to walk home underneath his large pile of holly which made him look like a moving holly bush. Breeze heard Lily say, “But what will we do if he doesn’t have time to stop? He is a busy man.” Breeze dropped his load of holly and sat down behind it. He wanted to hear the answer to Lily’s question. Breeze held his breath to hear more but Matt was whispering and he couldn’t find out what Matt planned to do. He collected the holly and decided it might be best to keep an eye on the group of children. He didn’t want them getting into trouble before Christmas. Breeze sighed, looked very sadly at his red berry and mushroom pie, “Don’t go anywhere.” He said, then decided to scoop it into his hands to eat as he followed Nell out into the cool evening air. “Where to, Lily?” Breeze asked. She pointed towards the clouds. They all stood looking at the twinkling stars and wondered what to do next. “He hasn’t even got his hat and coat,” Nell sobbed. Matt was happy inside his soap bubble which Lovisma’s spell had made strong as steel. Earlier when Matt asked her to create a spell to make the bubble bigger and stronger, Lovisma was curious to see what would happen. Matt sat on a cushion of moss inside the bubble which sat on a branch of a tree. Lovisma watched him until she got bored and left. As the sun began to sink in the sky the wind decided to play with the ogre sitting in the bubble. It pushed and pulled until the bubble was carried away high into the sky. Matt thought this was fun, he could see everyone below him. His mum was hanging out her washing. He waved at her but she couldn’t see him. The bubble swooped low and one of his dad’s vests was sucked into the bubble to land beside Matt. He put it on. The bubble swooped low over Tulips house. The windows were open because Tulip was baking. The bubble flew in one window and out another neatly snagging a freshly baked bun as it went. Matt felt happy. He was warm and he had a bun to eat. Matt waited to see what would happen next. The wind tired of lingering close to the ground climbed towards the stars. The air was colder up here. Matt pulled his dad’s vest about him and waited to see what would happen next. He grew tired and curling up in a ball he fell asleep. The Day the Trees cried. Daisy-Lyah was flying ahead of them. The thought of running always gave Breeze a headache so he walked. He was thinking this had better be good to have woken me from such a delicious nap when they came to a stop. He stared at the trees before them. “See the trees are crying please make them stop.” Daisy-Lyah’s bottom lip was wobbling while Lisbeth was jumping up and down on Breeze’s right foot. Breeze had never seen a tree cry and he was afraid to admit it but Breeze found this fascinating. 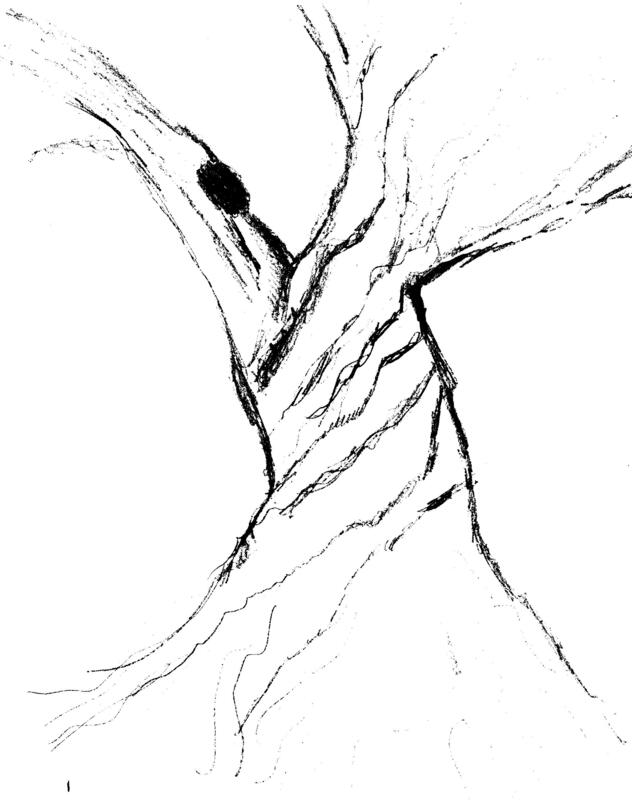 Why would a tree cry? He wondered, they have everything they need here. Nice rich soil, loads of sunshine and rain and I talk to them. They must be hurt” he whispered to the two girls. They ran away shouting, “We will get bandages”. When they were finished they stood back and admired their work. The trees wore ribbons of different colours. “They do look smart. They will heal quickly.” He told Lisbeth and Daisy-lyah who promised to check the bandages. “What made them cry?” Lisbeth asked. Breeze told her and said, “I think the problem is solved come and see.” He brought them to Hamish’s house and pointed at a tree close to the house. There sitting on a branch was a boot sitting on its side on a branch. “It is a smelly old boot.” Daisy-lyah whispered. On hearing his name the bird flew out of its new home and sat on a branch singing a happy song. 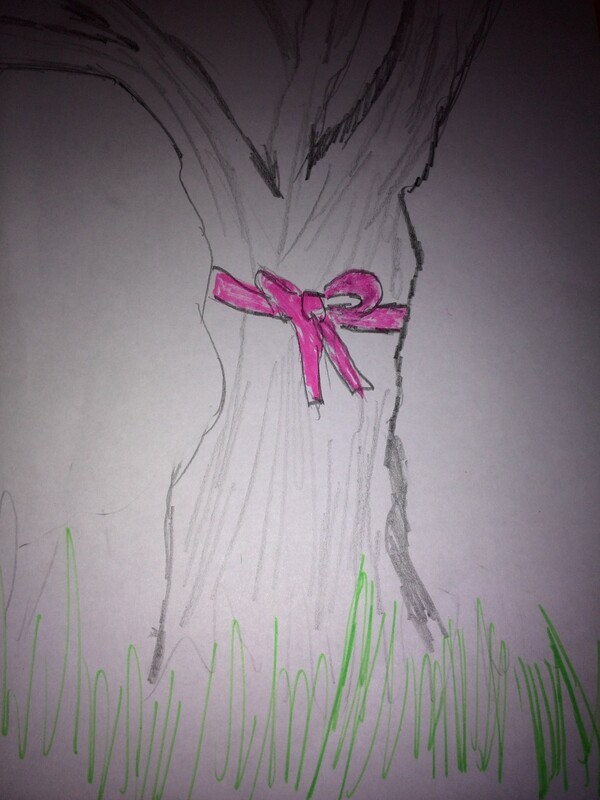 The trees did stop crying and they all loved their ribbons so much Lisbeth and Daisy-lyah had a new job to do each day. The Tale of the Curious Tree as told by Breeze. Breeze was left in charge of Mrs. Groundsels Grandchildren. “Tell us a story, please.” Lisbeth demanded flashing her dark blue eyes at him. Breeze sat and stared all around him. In the distance an old twisted tree caught his eye. “It wasn’t Lovisma then.” Lisbeth said and moved closer to him. “The tree was planted in a good place. It began to grow. A rabbit stopped one day beside the tree to scratch his ear. The tree bent sideways to ask the rabbit what it was doing. “I am itchy. So I am scratching the itch.” The rabbit said and then he hopped away. The tree decided it was good to know answers to simple questions. Whenever an animal stopped close to the oak it would move its body to look at the animal and ask a question or two. Over time the tree grew very knowledgeable about everyday things. He walked a long way then stopped before the tree. Lisbeth ran her hand along the bark. “You are a super-duper old tree. ” Breeze placed her on a low branch and jumped up beside her. “Does it know everything?” She asked Breeze. So Lisbeth left her note pinned to the tree. When she left Breeze slept, dreaming of dancing trees who became so knotted they fell over and grew on the ground.